Amaze Your Dinner Guests With The EMEMO Black Slate Designer Coasters! Make any dinner, party or home event a little more special with our slate designer coasters. Your friends and guests are bound to ask where you got these fancy coasters from! Be sure to tell them! Break the monotony of factory-produced, identical items. Our slate coaster set contains 4 coasters of the same size but of unique, handcrafted pattern. Enjoy your drink while admiring the elaborate, jagged edges of your coaster! The EMEMO black slate coasters are made from the finest charcoal slate. No chemicals involved! Every individual coaster in our black coaster set comes with 4 felt bumpers, ensuring your table remains both ring-free and scratch-free! We aim to please our customers, and we think we are doing a good job as testified by our high rating! If you find anything wrong with our slate coasters, simply return the set within 30 days for a replacement or a full refund! Supply For The Unique Black Slate Coaster Set Is Low, Click Add To Cart Now! 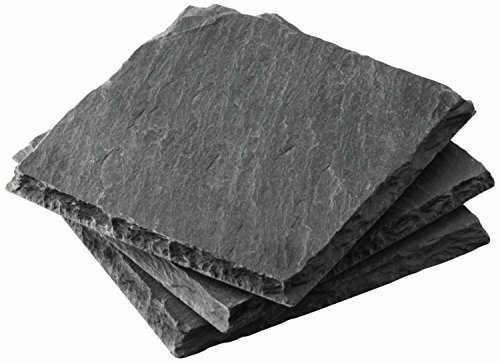 OUTSTANDING APPEARANCE: Make your dinner table or bar stand out with these gorgeous black slate coasters. If you are tired of bland or cute coasters, this EMEMO® coaster set is the stylish, adult choice! Give your kitchen a touch of authenticity and uniqueness with these awesome black slate coasters. FINEST MATERIAL AND DESIGN: The EMEMO® coaster set is handcrafted with genuine black slate, direct from natural charcoal! Each one is of 4''x 4'' size but has a unique, hard and rugged pattern. Because a completely symmetric coaster set would be boring! EASY TO CLEAN: No dust or residue involved, and you can/should easily clean any drops or spills off the coasters regularly with a simple damp cloth! TABLE SAFE: Don't be intimidated by the jagged-looking edges, our round slate coasters come with 4 felt bumpers each! Don't worry about the surface of your table, these coasters will leave it scratch-free! SATISFACTION GUARANTEED: We are confident you will love the EMEMO® slate coaster set. Just read our customer reviews! That's why we safely offer you a money back and replacement guarantee. Simply return the set within 30 days for a replacement or a full refund! If you have any questions about this product by EMEMO, contact us by completing and submitting the form below. If you are looking for a specif part number, please include it with your message.